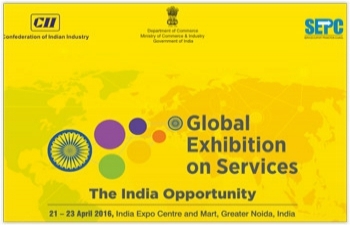 High Commission of India, Port of Spain, Trinidad and Tobago : News - Global Exhibition on Services, to be held from 20-23 April 2016, in Noida, New Delhi. The Ministry of Commerce and Industry, Government of India, in association with Confederation of Indian Industry (CII) and Services Export Promotion Council (SEPC), is organizing the 2nd Edition “Global Exhibition on Services from 20-23 April 2016 at India Expo Centre and Mart, Greater Noida, (National Capital Region), New Delhi”. 2. The main objective of the Global Exhibition is to promote greater exchange of trade in services between India and the rest of the World to tap the potential for services’ exports and to draw further investment into India in the services sector. The Exhibition will enhance strategic cooperation and develop synergies to strengthen multilateral relationships between India and the rest of the world in the Services Sector. (Hon’ble Prime Minister would inaugurate the Exhibition on 20th April 2016 in the presence of other global leaders). 3. Internationally, services are increasingly being traded, reaching US$ 4.6 billion of global exports in 2013 and recording a 5.6 percent annual growth at current prices. The commercial services accounted for 20 percent of total world trade in goods and commercial services in 2013, up 1 percent from the 2012 share. In 2013, India ranked 6th in the global exports of total services. In India, growth of services sector GDP (8.5 percent CAGR) has been higher than that of India’s overall GDP (7.1 percent CAGR) during 2000-01 to 2013-14. Also, this sector constitutes 57 percent of our GDP and contributes around 28 percent in overall employment. 5. GES will serve as a platform to enhance strategic cooperation and develop synergies between players of the services sector in India with their Global counterparts. Over 350 companies 60 companies from 64 countries participated during the 1st Edition of Global Exhibition of Services held last year 23-25 April 2015 Participation this year going to increase substantially. Concurrent with the exhibition there will be dedicated space for seminars with themes from the focus sectors with participation from Indian and foreign governments, corporates and business leader. There will be a dedicated space for seminars, B2B meetings and roundtables with themes surrounding focus sectors. There will be participation from major stakeholders including governments (both Indian & foreign) and corporate leaders. 6. You are requested to circulate the information among distinguished Members of your chamber/association to consider their participation in this mega event, which would help them to expand their business ties with Indian companies in service sector. More details of the exhibition can be found at event’s website: www.gesdelhi.in. Interested participants may contact Mr.Virender Gupta Deputy Director General CII, email: virendra.gupta@cii.in or Ms. Anjula Singh Solanky Director, CII, email: anjula.solanky@cii.in.